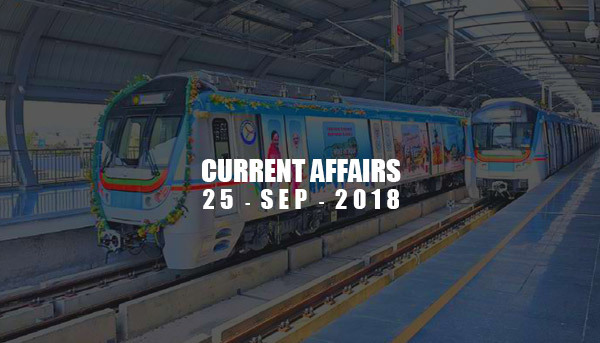 Current Affairs - Sep 25, 2018 - IAS - Daily Current Affairs, IAS Syllabus Exam Strategy, IAS Preparation. e-Vidhan, part of Digital India Programme, is a Mission Mode Project to digitize and make the functioning of State Legislatures paperless. Ministry of Parliamentary Affairs (Nodal Ministry for this project) desires to roll out e-Vidhan as National e-Vidhan Application (NeVA), covering all 40 Houses including two Houses of Parliament and State legislatures. This project was first executed in Himachal Pradesh which made the Shimla Legislative Assembly the first Assembly in India to go paperless in 2014. It can be used by - Government Departments, Chair of Houses to conduct proceeding smoothly, Members of Houses to carry duties, and anyone can access the information on business in legislatures through NeVA mobile app (a workflow based app) deployed on MeghRaj Cloud. Hyderabad Metro Rail (45 km) has now become the second largest metro rail network in India after Delhi Metro(350 km). Scientists have successfully grown world's first oesophageal organoids (miniature, functional versions of the human food pipe) using pluripotent stem cells. The production of organoids using stem cells paves new ways to study and test drugs against gut disorders. The organ can be affected by congenital diseases called oesophageal atresia - a narrowing or malformation of the esophagus caused by genetic mutations. Ministry of Housing and Urban Affairs has released the state wise ranking of Ease of Living Index to help the cities assess their liveability vis-à-vis national and global benchmarks. Top three are Andhra Pradesh, Odisha, and Madhya Pradesh respectively. Ministry has earlier revealed the ranking of cities based on four pillars namely Institutional, Social, Economic and Physical. Three cities in Maharashtra - Pune, Navi Mumbai and Greater Mumbai topped the first Ease of Living Index. The national capital, New Delhi, is ranked 65 among 111 cities, while Chennai is in 14th place. While Kolkata did not participate in the survey. Ministry of Science and Technology, Earth Sciences in association with Vijnana Bharati is organizing this festival since 2015 (1st hosted in Delhi). Like previous years this year too, World Record attempt will be made, and this time it will be “isolate DNA” by 500 students from class 8th to 10th standard.